Formalin fixed, paraffin embedded mouse heart stained with Rabbit anti Human ATG13 (AHP2242) following heat mediated antigen retrieval using sodium citrate buffer (pH6.0). Western blot analysis of rat heart tissue lysate probed with Rabbit anti Mouse ATG13 (AHP2242) at 1μgml-1 in the absence (A) or presence (B) of blocking peptide. 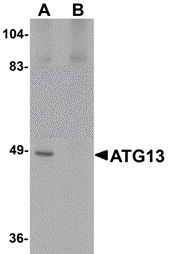 Rabbit anti Human ATG13 antibody recognises human Autophagy-related protein 13 (ATG13), a 517 amino acid ~55 kDa protein belonging to the ATG13 metazoan family. A synthetic peptide corresponding to 15 amino acid sequence from near the carboxy terminus of human ATG13. AHP2242 detects a band of approximately 49 kDa in Rat heart tissue lysates.